There are so many great Canadian yarn dyers and pattern makers that it’s not too hard to go Canadian for Canada Day. If you haven’t tried any of the following I encourage you to support your countrymen and countrywomen! 1. Biscotte and Cie: we shall start with the newest, Biscotte and Cie. These self striping yarns from Quebec will make an adorable baby sweater or a funky pair of socks! 2. SweetGeorgia: always a favorite of mine pick up a luscious skein of Merino Silk Lace or CashSilk lace and knit up a summery shawl for those cool nights. 3. Me! : I can’t say enough about how great I am really There are Gourmet Crafter patterns and yarn as well as Tin Can Knits book 9 Months of Knitting! 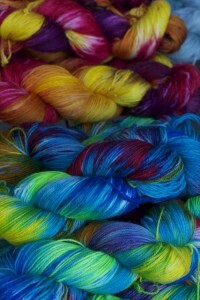 Gourmet Crafter yarn is inspired by photographs I have taken of the world around me. Whether it’s Moraine Lake in the Rockies or Cherry Blossoms on Highbury street! 4. 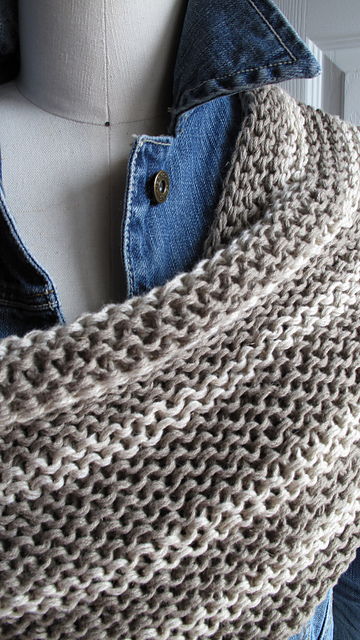 Amanda Kaffka: a popular gal around the shop, check out Amanda’s chic and trendy knits. Here latest Jenny wrap is a summery striped version, perfect for a night out! 5. Michael Wynne: If you are looking for the perfect heirloom baby blanket check out Michael’s Hap Style. It has the perfect combination of simple garter and pretty lace to create a blanket any mum would be delighted to receive. This entry was posted on Thursday, June 28th, 2012 at 6:44 pm	and is filed under Uncategorized. You can follow any responses to this entry through the RSS 2.0 feed. Both comments and pings are currently closed.